Satnav Warning - don't rely on your satnav for the last bit. 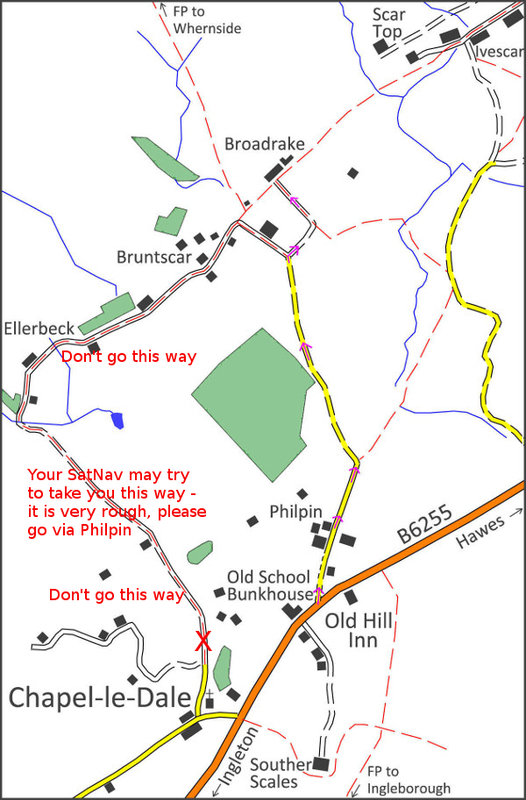 Some satnavs will try to take you past Chapel-le-Dale Church on the track towards Ellerbeck. It is a private road along a mile and a half of very rough track. Please don't go this way. We strongly recommend all drivers take note of the map and directions below, particularly as there is no mobile reception locally so you won't be able to ring for help. From Ingleton take the B6255 signposted Hawes. About 4 miles out from Ingleton go past a sign to Chapel-le-Dale Church (don't turn here). Up the hill a few hundred yards further is the Old School Bunkhouse on the left. The Old Hill Inn is 100yds further on the right so if you get there you've gone too far. You are now on Philpin Lane, a single track road heading for a farm. Follow the lane through the farmyard then through fields for about 3/4 mile. You will cross 5 cattle grids then at the end of the metalled road just before what would be the 6th cattle grid is a "No Parking" notice and low on the right a sign for	Broadrake. Turn right here before the cattle grid following the unmade track along the side of a couple of fields and a final cattle grid on the corner to arrive at Broadrake. 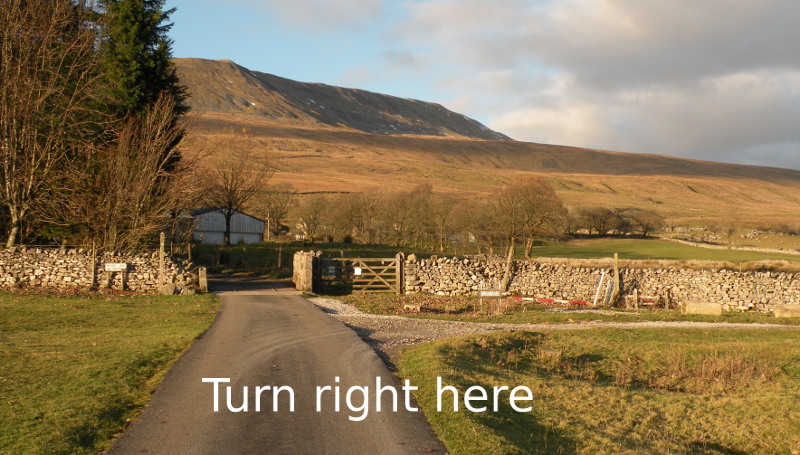 About 1 1/2 miles from Ribblehead pass the Old Hill Inn on the left and turn right immediately before	the Old School Bunkhouse car park. It's sharp right almost coming back on yourself. You are now on Philpin Lane so follow the directions from there as above. The last bit is along an unsurfaced track, OK in normal cars provided they aren't really low slung. Occasionally after very heavy rain Philpin Lane may flood in the dip after the farmyard. In local parlance "the road is out". In these circumstances DO NOT try to cross. Your best bet is to retire to the Hill Inn and phone us from there.